Super-computer modelling of Earth's crust and upper-mantle suggests that ancient geologic events may have left deep 'scars' that can come to life to play a role in earthquakes, mountain formation, and other ongoing processes on our planet. This changes the widespread view that only interactions at the boundaries between continent-sized tectonic plates could be responsible for such events. A team of researchers from the University of Toronto and the University of Aberdeen have created models indicating that former plate boundaries may stay hidden deep beneath the Earth's surface. These multi-million-year-old structures, situated at sites away from existing plate boundaries, may trigger changes in the structure and properties at the surface in the interior regions of continents. "This is a potentially major revision to the fundamental idea of plate tectonics," says lead author Philip Heron, a postdoctoral fellow in Russell Pysklywec's research group in U of T's Department of Earth Sciences. Their paper, "Lasting mantle scars lead to perennial plate tectonics," appears in the June 10, 2016 edition of Nature Communications. Heron and Pysklywec, together with University of Aberdeen geologist Randell Stephenson have even proposed a 'perennial plate tectonic map' of the Earth to help illustrate how ancient processes may have present-day implications. "It's based on the familiar global tectonic map that is taught starting in elementary school," says Pysklywec, who is also chair of U of T's Department of Earth Sciences. "What our models redefine and show on the map are dormant, hidden, ancient plate boundaries that could also be enduring or "perennial" sites of past and active plate tectonic activity." To demonstrate the dominating effects that anomalies below the Earth's crust can have on shallow geological features, the researchers used U of T's SciNet - home to Canada's most powerful computer and one of the most powerful in the world- to make numerical models of the crust and upper-mantle into which they could introduce these scar-like anomalies. The team essentially created an evolving "virtual Earth" to explore how such geodynamic models develop under different conditions. "For these sorts of simulations, you need to go to a pretty high-resolution to understand what's going on beneath the surface," says Heron. "We modeled 1,500 kilometres across and 600 kilometres deep, but some parts of these structures could be just two or three kilometres wide. It is important to accurately resolve the smaller-scale stresses and strains." Using these models, the team found that different parts of the mantle below the Earth's crust may control the folding, breaking, or flowing of the Earth's crust within plates - in the form of mountain-building and seismic activity - when under compression. In this way, the mantle structures dominate over shallower structures in the crust that had previously been seen as the main cause of such deformation within plates. "The mantle is like the thermal engine of the planet and the crust is an eggshell above," says Pysklywec. "We're looking at the enigmatic and largely unexplored realm in the Earth where these two regions meet." 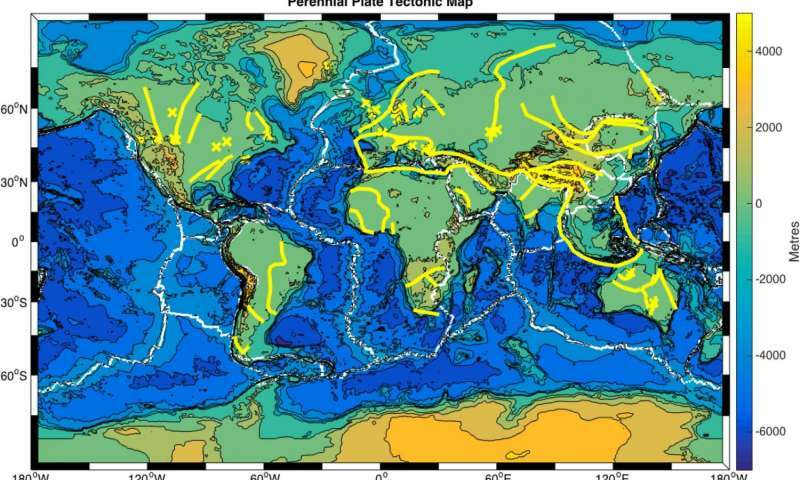 "Most of the really big plate tectonic activity happens on the plate boundaries, like when India rammed into Asia to create the Himalayas or how the Atlantic opened to split North America from Europe," says Heron. "But there are lots of things we couldn't explain, like seismic activity and mountain-building away from plate boundaries in continent interiors." 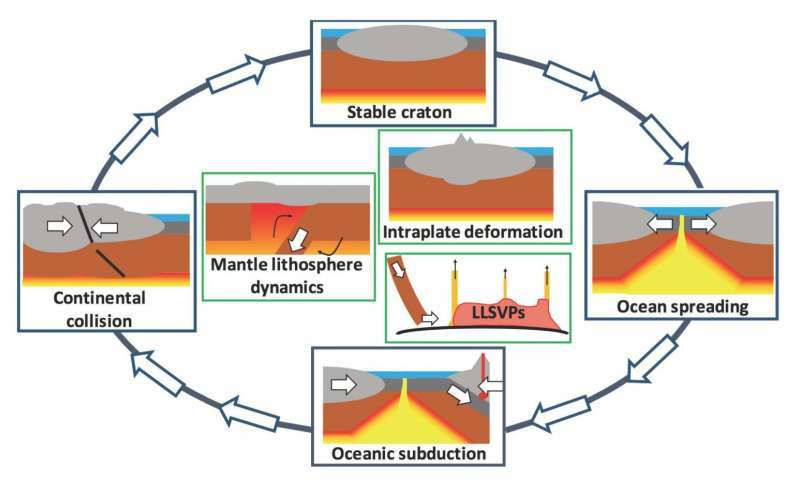 The research team believes their simulations show that these mantle anomalies are generated through ancient plate tectonic processes, such as the closing of ancient oceans, and can remain hidden at sites away from normal plate boundaries until reactivation generates tectonic folding, breaking, or flowing in plate interiors. "Future exploration of what lies in the mantle beneath the crust may lead to further such discoveries on how our planet works, generating a greater understanding of how the past may affect our geologic future," says Heron. The research carries on the legacy of J. Tuzo Wilson, also a U of T scientist, and a legendary figure in geosciences who pioneered the idea of plate tectonics in the 1960's. "Plate tectonics is really the cornerstone of all geoscience," says Pysklywec. "Ultimately, this information could even lead to ways to help better predict how and when earthquakes happen. It's a key building block." Not new, fundamentally excepted the complex thermo-mechanical simulation of deep earth. It is quite evident that along apparent ancient suture zones, India is moving fast under Hymalaya and Tibet, also ocean plate under Indonesia , with dramatic earth quakes of force 9, and ancient broken zones are more fragile with rare earthquekes !! In Mediterranean Sea, the drawn as ancient suture zone is a present-day plate boundarie with real plate opening quite strongly moving, opening again Gibraltar 6 millions years ago and pushing Alps and Italy, and also giving earth quakes and tsunami in 1755 at Lisbon, in a very complex system not anly ancient, with two opposite movements, closing by Africa and opening by the real present-day plate boundarie, wrongly drawn in yellow around Europe and Mediterranean Sea !! In Africa some ancient zones are missing where Aqfrica could have been broken 120 millions years ago ! !